The Eide family celebrated New Years Eve in style this year. 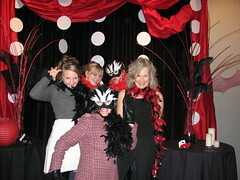 In an attempt to put a little celebratory life in the evening, we bought tickets to the Mars Hill Church Red Hot Bash. Mike had noticed the event online a month ago, and Jenny made sure we followed through. The festivities at Mars Hill started at 9:30. They had a very live and loud jazz band playing salsa and funk music. Just about everyone at least tried a little dancing. Mike and Marti made a good show for the older generation and Jenny, with some help from Bjorn, out danced us all. Needless to say, the celebration was out of character for a bulthuis/eide celebration, but I guess the new member of the family pumped a little life into the dutch/norwegian veins. All I can say is: it wasn't your typical church watchnight service.